Q. Do we have any units available for preorder? A. If it's on the website for preorder, then yes, we do. We only put things up for preorder which we can supply. This is how we operate. As long as it's up for preorder, then you can get one if you preorder one. If it disappears, then it means we have sold out. Disappearing items may return for preorder again if we secure more stock but this doesn't happen all the time. Q. Will we get them before Christmas? A. We will get them by the date shown on the preorder. Next day shipping from there. Q. Will we be getting this/that game in? A. Anything up for preorder, we'll get. Anything not up for preorder, ask us about. Q. Will the power supply/charger work in the UK/Europe or will I have to buy a step down transformer. A. We don't actually know for sure yet but the PSP's charger was 100-240v (multi voltage) so didn't need a step down transformer. All you had to do is either use a pin adaptor (shaver adaptor) or use a local 'figure of eight' power cable to plug into it. 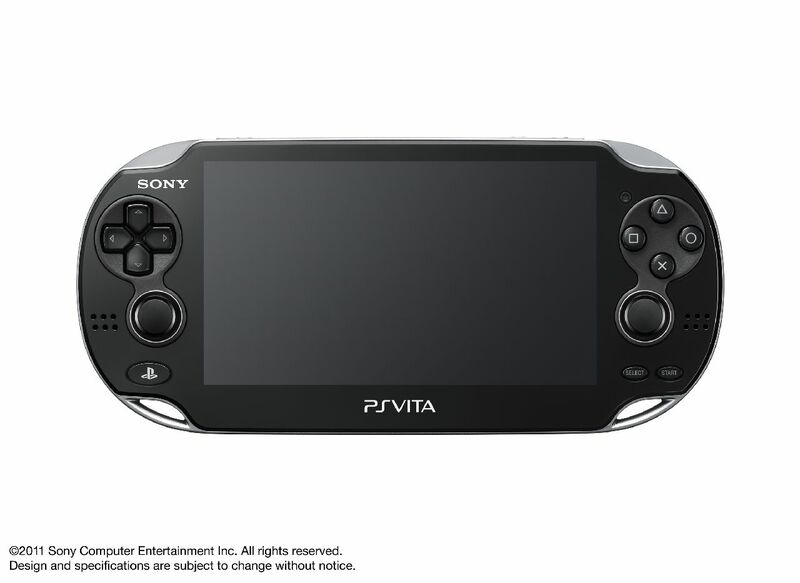 We're guessing the PS Vita will be the same as this. A. Not sure/probably not. This is a Japanese system, and while you may be able to set your system language to English, it's really down to the programmers and what they put into the game. As a rule of thumb, if you're buying an arcadey title, you should be OK even if it is all in Japanese. If you're buying an RPG then you'd better be able to read Japanese! If this worries you, then you can try to dome some homework on the subject. Check out some videos of the games in action from the Tokyo Game Show, try to find out if you can actually see the text and menus. If you can't find out, then assume it will be in Japanese. We've been selling Japanese games to customers since 1991 to people who specifically want Japanese items so it's up to the customer to decide on the level of foreign text he or she is happy with. A. Sony said that they would. Q. Do I need a memory card? A. The PS Vita memory cards are a proprietry format/exclusive to the PS Vita so you need a PS Vita memory card to work with the PS Vita. You can't just grab any old SD card. We've been told that some games need a memory card just to start up (!) so we'd recommend you get something to avoid the potential major disappointment/rage which may occur if you buy a system and a game only for it to tell you that you need a memory card inserted to even get the game started. We may be getting larger memory cards before Christmas, but right now, all we can confirm are the ones up for preorder. If you'd prefer a larger memory card, then we'd recommend you buy one of the ones up for oreprder but in the additional comments box, mention that you're interested in upgrading to a larger one if possible and we'll contact you if we do get some. Lastly, here's the situation as we see it and the advice we'd give: right now, we have units available. We also have games available. Not the same number of games and systems, obviously. We just ordered what we thought was the right balance but as we get closer to selling out, there'll be some imbalances. But we're getting so many emails from people who seem to be sitting on the sidelines at the moment and going by what happened with the PSP launch, when we suddenly had the units available and showed that we did have them and could supply them and at the price we quoted too (unlike many other online outlets/liars), all these customers suddenly crawled out of the woodwork and wanted one. Luckily we had extra units and we also had a good supply line going but even then, the demand increased so much and so quickly that we increased the price of new orders just to try to slow sales down (cries of 'why is it more expensive?' Reply: you should have bought one earlier). With the Vita, it's very different and not in a good way. There's a crucial and very tiny window of opportunity as the system is being launched so close to Christmas. We probably won't have any time to make a second order before Christmas. A second order will likely be between Christmas and New Year, and a third order will be likely only be in January, by which time you've kind of missed the nice Christmas buzz and the local/official launch is so close that unless you specifically want a Japanese machine, then it may not be worth paying extra to get one (unless we end up with major shortages of official/local ones of course). Also, since the PSP's launch, we now have new laws and rules about what can and can't be sent and who can or will send them. Sadly we don't have a ton of suppliers who are allowed to send us PS Vitas from Japan because of their 'dangerous batteries'. Anyone caught sending these things without the correct paperwork and permission may run into major problems and again, as it's so close to Christmas, there's no time to sort it out. So we have to be careful who we buy from to try to avoid any hold-ups. Basically, what we're saying is try to decide if you want a Japanese one at launch or not. If you do, then try to order one ASAP. We are getting them but we know we're going to make a lot of people who haven't ordered one from us yet disappointed. We can see this is going to happen but we can't do anything about it: it's up to the customer to get an order in. There are no benefits of not preordering early if you do want one.